Between 1914 and 1918 approximately 65 million men marched to war; over 8 million never returned in one of the bloodiest conflicts in human history. Centennial Park is proud to be the resting place for thousands of returned service men and women. 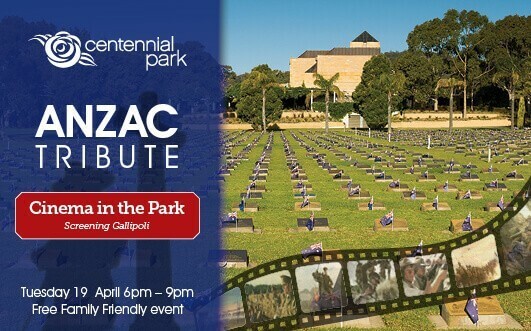 This ANZAC Day, as we commemorate those who proudly served our country, Centennial Park’s stunning gardens will be transformed into an outdoor cinema venue. Bring along your family and friends and join us for a free screening of the Australian classic World War I film, Gallipoli (PG rated). Students from Scotch College will continue the annual tradition of placing over 3,500 Australian flags on memorial headstones, providing a poignant and moving backdrop to the evening. Local RSL groups will host a fundraising BBQ catering for vegetarians also. Families are welcome to bring along picnic hampers, however no BYO alcohol is permitted. The travelling History SA war exhibition Blue Jeans Jungle Greens will be on show in Centennial Park’s Jubilee Complex throughout the entire month of April (1-31 April). The exhibition traces the political and social turmoil of the 60s and 70s, examining both the conflict in Vietnam and other social movements of the time. Come join us at Centennial Park for this commemorative event, to honour, remember and acknowledge the bravery and sacrifice made by Australia’s service men and women during times of war. For more information on the event please contact us on 8275 2217. When: Tuesday 19 April at 6pm. Type: Family friendly event. NO BYO alcohol. Ample free parking is available on site.